Characteristics Taq DNA Polymerase is a thermostable DNA Polymerase isolated from an E. coli strain that carries the Taq DNA polymerase gene. Taq DNA Polymerase is the most common polymerase used for PCR. 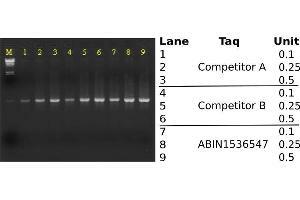 Application Notes The applications of Taq DNA Polymerase include the following: PCR 3' A-tailing of blunt ends Primer extension DNA sequencing. Terminal transferase activity: Taq DNA Polymerase has terminal transferase activity, which results in the addition of a single nucleotide (adenosine) at the 3' end of the extension product. High purity: No contamination activity has been detected in standard test reactions. Terminal Transferase Activity: A single nucleotide (adenosine) is added to the 3' end of the extension product. High-purity: No contamination activity has been detected in standard test reactions. Unit Definition: one unit is defined as the amount of enzyme that can incorporate 10 nmol of dNTP into acid-insoluble material in 30 minutes at 74°C. Buffer 500 mM KCl, 100 mM Tris HCl (pH 9.0 at 25°C), 15 mM MgCl2, 1% Triton X-100 Buffer. This buffer is optimized for use with 200 µM dNTPs. Note: If the reaction is performed without this buffer, then add 0.1% Triton X-100 (final concentration) to ensure high activity. Concentration: Taq is delivered in 5 units/µl in 20 mM Tris HCl (pH 8.0), 0.1 mM EDTA, 1 mM DTT, 0.1% Triton X-100 and 50% glycerol. Storage Comment Store the product at -20°C. The enzyme can be shipped at room temperature or even 37°C for seven days without any loss of activity. Product cited in: Lee, Rollwagen-Bollens, Bollens, Faber-Hammond: "Environmental influence on cyanobacteria abundance and microcystin toxin production in a shallow temperate lake." in: Ecotoxicology and environmental safety, Vol. 114, pp. 318-25, 2015 (PubMed). González, Brito, González: "Identification of glycoproteins secreted by wild-type Botrytis cinerea and by protein O-mannosyltransferase mutants." in: BMC microbiology, Vol. 14, pp. 254, 2015 (PubMed). Boyd, Tennant, Melendez, Toema, Galen, Geddes, Levine: "Adaptation of red blood cell lysis represents a fundamental breakthrough that improves the sensitivity of Salmonella detection in blood." in: Journal of applied microbiology, Vol. 118, Issue 5, pp. 1199-209, 2015 (PubMed). Miersch, Li, Hanna, McLaughlin, Hornsby, Matsuguchi, Paduch, Sääf, Wells, Koide, Kossiakoff, Sidhu: "Scalable high throughput selection from phage-displayed synthetic antibody libraries." in: Journal of visualized experiments : JoVE, Issue 95, pp. 51492, 2015 (PubMed). Thekke-Veetil, Polashock, Marn, Plesko, Schilder, Keller, Martin, Tzanetakis: "Population structure of blueberry mosaic associated virus: Evidence of reassortment in geographically distinct isolates." in: Virus research, Vol. 201, pp. 79-84, 2015 (PubMed). Maxfield-Taylor, Mujic, Rao: "First detection of the larval chalkbrood disease pathogen Ascosphaera apis (Ascomycota: Eurotiomycetes: Ascosphaerales) in adult bumble bees." in: PLoS ONE, Vol. 10, Issue 4, pp. e0124868, 2015 (PubMed). Frías, Brito, González, González: "The phytotoxic activity of the cerato-platanin BcSpl1 resides in a two-peptide motif on the protein surface." in: Molecular plant pathology, Vol. 15, Issue 4, pp. 342-51, 2014 (PubMed). Acanda, Martínez, Prado, González, Rey: "EMS mutagenesis and qPCR-HRM prescreening for point mutations in an embryogenic cell suspension of grapevine." in: Plant cell reports, Vol. 33, Issue 3, pp. 471-81, 2014 (PubMed). Zhang, Liu, Liu, Zhang, Cao, Ye, Wang, Zhang, Xiao, Yang, Li, Bai: "Transcriptome profiling of a multiple recurrent muscle-invasive urothelial carcinoma of the bladder by deep sequencing." in: PLoS ONE, Vol. 9, Issue 3, pp. e91466, 2014 (PubMed). Boyd, Tennant, Saague, Simon, Muhsen, Ramachandran, Cross, Galen, Pasetti, Levine: "Serum bactericidal assays to evaluate typhoidal and nontyphoidal Salmonella vaccines." in: Clinical and vaccine immunology : CVI, Vol. 21, Issue 5, pp. 712-21, 2014 (PubMed). Zhan, Bailey, Heath, Macisaac: "Performance comparison of genetic markers for high-throughput sequencing-based biodiversity assessment in complex communities." in: Molecular ecology resources, Vol. 14, Issue 5, pp. 1049-59, 2014 (PubMed). Yoon, Hossain, Held, Hou, Kehl, Tromas, Sato, Tabata, Andersen, Stougaard, Ross, Szczyglowski: "Lotus japonicus SUNERGOS1 encodes a predicted subunit A of a DNA topoisomerase VI that is required for nodule differentiation and accommodation of rhizobial infection." in: The Plant journal : for cell and molecular biology, Vol. 78, Issue 5, pp. 811-21, 2014 (PubMed). Thompson, Taran: "Genetic characterization of the acetohydroxyacid synthase (AHAS) gene responsible for resistance to imidazolinone in chickpea (Cicer arietinum L.)." in: TAG. Theoretical and applied genetics. Theoretische und angewandte Genetik, Vol. 127, Issue 7, pp. 1583-91, 2014 (PubMed). Chuang, Liao, Chang, Wang, Lin, Hsieh: "Ciliated muconodular papillary tumor of the lung: a newly defined peripheral pulmonary tumor with conspicuous mucin pool mimicking colloid adenocarcinoma: a case report and review of literature." in: Pathology international, Vol. 64, Issue 7, pp. 352-7, 2014 (PubMed). Espino, González, González, Brito: "Efficiency of different strategies for gene silencing in Botrytis cinerea." in: Applied microbiology and biotechnology, Vol. 98, Issue 22, pp. 9413-24, 2014 (PubMed). Koide, Wellman: "SAH-induced MMP activation and K V current suppression is mediated via both ROS-dependent and ROS-independent mechanisms." in: Acta neurochirurgica. Supplement, Vol. 120, pp. 89-94, 2014 (PubMed). He, Wang: "DNA consensus sequence motif for binding response regulator PhoP, a virulence regulator of Mycobacterium tuberculosis." in: Biochemistry, Vol. 53, Issue 51, pp. 8008-20, 2014 (PubMed). Firlej, Doyon, Harwood, Brodeur: "A multi-approach study to delineate interactions between carabid beetles and soybean aphids." in: Environmental entomology, Vol. 42, Issue 1, pp. 89-96, 2013 (PubMed). Gandhirajan, Meng, Chandramoorthy, Mallilankaraman, Mancarella, Gao, Razmpour, Yang, Houser, Chen, Koch, Wang, Soboloff, Gill, Madesh: "Blockade of NOX2 and STIM1 signaling limits lipopolysaccharide-induced vascular inflammation." in: The Journal of clinical investigation, Vol. 123, Issue 2, pp. 887-902, 2013 (PubMed). Wang, Kohalmi, Svircev, Wang, Sanfaçon, Tian: "Silencing of the host factor eIF(iso)4E gene confers plum pox virus resistance in plum." in: PLoS ONE, Vol. 8, Issue 1, pp. e50627, 2013 (PubMed).